KOFI A. ANNAN of Ghana , the seventh Secretary-General of the United Nations, served from 1997 to 2006 and was the first to emerge from the ranks of United Nations staff. The world has lost a great man in Kofi Annan. I will miss him. My heartfelt condolences to the family of Kofi Annan. An invaluable proponent of world peace, justice, and equality. Humanity has lost a great champion of peace. Before becoming secretary-general, he was under-secretary-general for peacekeeping and also served as special representative of the secretary-general to the former Yugoslavia between 1995 and 1996. So very saddened by the death of Kofi Annan – an exceptional man tested by our cascading history. He did all in his power to uplift humankind..
Kofi Annan didn’t just talk about building a more just and peaceful world, he dedicated his life to doing it – and the world is a better place because of him. It’s now up to all of us to carry his work forward. Kofi Annan was a beacon of light to the international community, a consummate humanitarian, and a friend to all those who strive to make the world a better place. All of us at the IMF mourn his passing, but continue to be inspired by his legacy. Kofi Annan, the first black African to lead the United Nations and Nobel Laureate has died at age 80. He was the quintessential diplomat; a man who was able to bring people together. My condolences on the demise of Mr Kofi Annan.The Former UN Secretary General and Nobel laureate was a great son of Ghana, & a long-standing friend of India. He was a respected voice in global affairs & South-South cooperation. Kofi Annan set an example of reconciliation, leadership, integrity and service, underpinned by deep Christian faith. We remember him in prayers of great gratitude. Blessed are the peace makers….. The world Has lost a rare gem. This distinguished gentleman impacted many lives. Kenya has lost a friend. Africa has lost a son. @OneYoungWorld has lost a guiding force and I a mentor. He will be missed. My heart is heavy. RIP Kofi Annan. On my sister's first day at the Gates Foundation she got to meet him, and it's one of the best stories she tells. 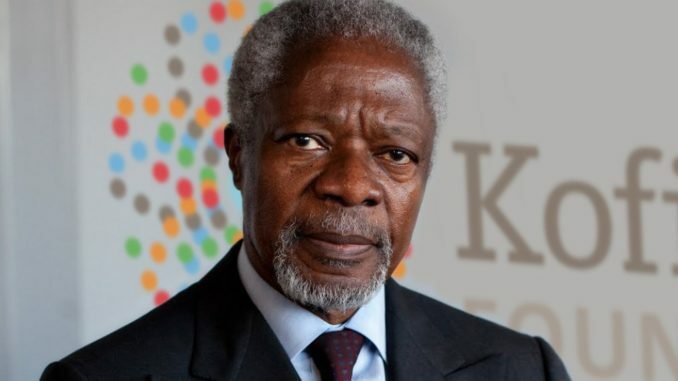 Thank you for the leadership and dedication for the humanity over the years, #KofiAnan. As a Secretary General, Kofi Annan visited the Maldives to witness the destruction caused by the tsunami first hand in 2005. When I got UN scholarship in 1997, Kofi Annan was the Secretary General.He hosted lunch for 4 of us frm 4 different countries in UN HQ in Newyork.Were impressed by his politeness/humbleness.He shook hands with us/shared table for lunch.Can’t believe he is no more. My condolences.